Event Recap: more than 200 Tiger alumni, friends and parents converged to Butler University on Saturday, September 22nd to join the Princeton Varsity Club, Princeton Football Association and Princeton Alumni Association for pre-game festivities. The festivities didn’t end there, as Princeton Football treated everyone to a commanding 50-7 victory in the Sellick Bowl. A photo galley from the Tiger Tent Tailgate can be viewed here. 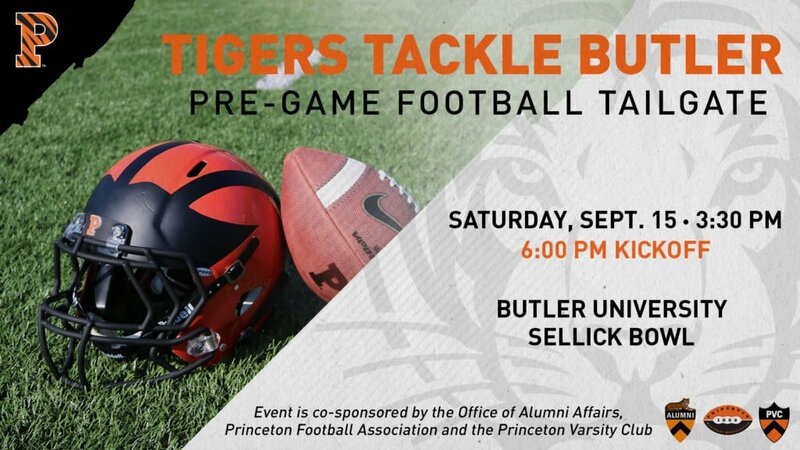 The Princeton Varsity Club, Princeton Football Association and the Office of Alumni Affairs invite you to join fellow Tiger fans for a pre-game football tailgate in advance of Princeton football’s season opener vs. the Butler Bulldogs under the lights in Indianapolis on Saturday, September 15th. WHEN: Saturday, September 15th — 3:30pm Tailgate, 6:00pm Kickoff (please note that Butler is in the Eastern time zone). 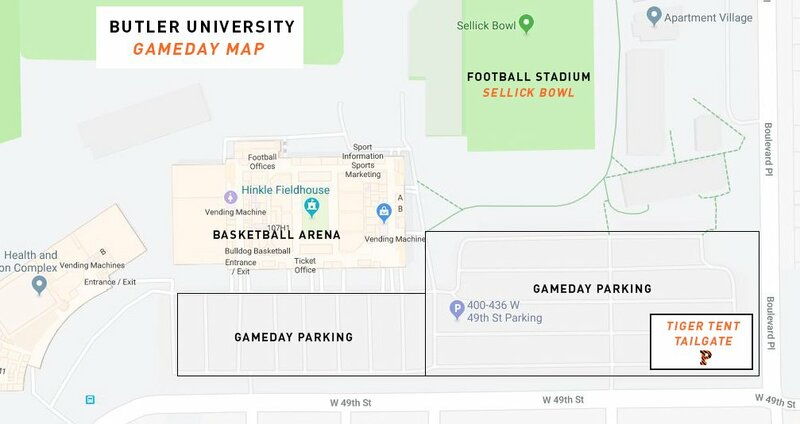 WHERE: Butler University (4600 Sunset Ave, Indianapolis, IN 46208); the Princeton tailgate event will be held in a tented area of the main tailgate lot, a short walk from the Sellick Bowl. Click here to view a map of the event location, which is located in the corner of the lot closest to the intersection of Boulevard Pl. and W. 49th Street. WHAT: Enjoy great food, drinks, entertainment from the Princeton University Band, and more before cheering on the Tigers in the Sellick Bowl. Click here to purchase your Tiger Tent tailgate ticket – $20 in advance for all PVC and PFA members, and free for children 12 and under; includes food and beer/wine (game tickets sold separately – instructions below); tickets will be $25 for all day of registrants. A discounted $8 group rate ticket is available to all Princeton fans via the Butler Ticket Office using the below promo code (NOTE: children two and under are free; there is a small handling fee on top of the ticket price). Stadium seating is general admission. Please purchase your football game tickets directly from the Butler Athletic Ticket Office using the instructions below. Gameday parking is available in the main tailgate lot (Hinkle Fieldhouse main parking lot), which is located just south of the Sellick Bowl at the intersection of Boulevard Pl. and W. 49th Street. Parking is also available in the Butler parking structure located just to the west of Hinkle Fieldhouse. There is a $10 fee to park in these gameday lots. The Sellick Bowl has a no re-entry policy; once you enter the stadium for the game, you may not leave and return. This will be the first game that Butler is offering alcohol sales in the stadium. NOTE: Hinkle Fieldhouse (historic basketball arena) will be hosting a ticketed event on Saturday, September 15th, and will be closed to the non-paying public for much of the afternoon.